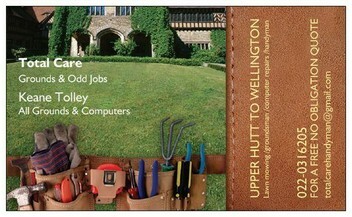 Upper hutt - lower hutt all jobs. may travel if there's 4+ hours work as far as wellington. All job waste grass, trees, etc get removed FREE OF CHARGE. custom built computers for home user or extreme gaming. We had Keane come for a day and do some section clearing. He worked so hard and made an amazing job of our front bank. We would highly recommend Keane to anyone looking for help on their section. We will definitely be using Keane again for future work. Thank you very much Keane for the excellent job you did on both of my laptops. A pleasure to deal with and would certainly recommend his services. Wow!! What an amazing worker Keane is!! He did a very professional job of removing two trees from one of our properties. Left the site clean and tidy!! Have already got Keane lined up to quote on a couple more jobs that need doing!! Will definitely keep this Handyman on my books. We live in Riverstone Terraces and our home is built in by broom and gorse. We needed a lot of bank cleared to say the least... Keane gave a quote and upon starting he exceeded the expectations for the job. We really appreciate the work on our property and Would not hesitate to recommend Keane to your job. Great guy, great worker, excellent result. Highly recommended. Keane was awesome he came to an ugly mess of a back yard and when he left wow what a difference he levelled my section all ready to lawn again(fantastic). He is a realy nice chap to talk to and works very hard,very trust worthy and had top communication skills with us even when his car broke down on him. 100% would use him again and highly recommend him to everyone. Keane has just done a great job for me. An impulse Trade me purchase needed picking up and shipping to Christchurch and Keane was so obliging and helpful that it took all the stress out of the situation. I would heartily recommend his services. Keane has a great work ethic. He performs beyond his duties and takes pride in his work. It is hard to find people with willingness to finish the job to this standard. I will recommend Keane to anyone and hope that when he comes to Jville area, he can help me with one off's. Exceptional service. Keane is one hard working guy! Fantastic service, takes great pride and care in the work he does. He has done a fantastic job of washing our house, clearing our section of over grown grass that the council have not done, cut down several tree's, chopped fire wood, water blasted all of our paths, steps & Driveway. We can totally recommend him to anyone "he is a great guy and honest about the work he does", he will do the work to your satisfaction. "If it's not right he will make it right"
Keane is brilliant! Worked tirelessly to bring my section back to it's former glory and will be maintaining the lawns for me from now on - sooooooo pleased I made contact with him. If you need help around your yard don't hesitate to contact Keane, he is sure to do a fantastic job for you! Honest and reliable too! Keane has been amazing and patient with my out of control lawns and gardens and has done an excellent job....so excellent I have made Keanes maintenance a regular thing. I have 100% faith in referring his services to others. Thanks heaps! I am very impressed by the attention to details and his great attitude towards what he does. I am happy that I called him for moving lawns and I have already requested him to come once a month to my place to do the lawns. Cheers.